HARTLEPOOL-born Ryan Brobbel admits it affects him more than most when Pools do badly. The 21-year-old winger is a Middlesbrough player but this week extended his loan stay at Hartlepool United for a further four weeks. Brobbel insists he had no intention other than to stay at Pools but admits he can get a grilling from friends and family when results go against his hometown team. 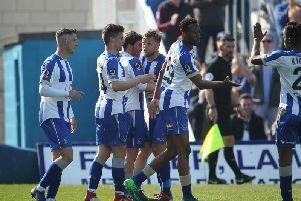 Pools hit rock bottom of the Football League under ex-boss Colin Cooper before an impressive 2-1 win at Exeter City last weekend lifted spirits and places in the league table. Brobbel has been impressed with life under caretaker boss Sam Collins and believes there is too much talent in the squad for this season to turn into a relegation battle. “It does affect me coming from Hartlepool,” Brobbel told SportMail. “A lot of my friends and family are from Hartlepool and they are always asking what is going on when we lose! “But I always knew we wouldn’t stay near the bottom for too long and that we were always good enough to climb up the league. “Hopefully we can continue that now. “We got a great win down at Exeter and scored two good goals and when we do go in front we are usually the better team. “I didn’t think we were threatened too much last week, even when they came back into it. “Getting the win was nice but it is different to what I experienced on loan at York City last year. “Last season we did so well and got to the play-offs. So far the former High Tunstall pupil has made 14 appearances for Pools and he will now remain on-loan from Championship neighbours Boro until November 8. Brobbel added: “Extending my stay was always what I wanted to do. “I am really happy here. “I am playing, which is what I wanted to come here and do and I am playing a part in every game. “It is helping my development as a footballer, playing league football week in, week out. Brobbel, capable of playing on either wing, is one of the first names on the team sheet at Pools and he was brought to the club by Cooper in the summer. He admits the approach has been different under Collins but added the players have quickly climatized to the interim manager’s methods. “I have played a few games with Sam and it was a bit strange at first,” admitted the winger. “He is good enough to do the job though and has always been around doing coaching sessions anyway so it hasn’t been too much of a change. “The presentations he does are a bit different but a few of the clubs I have been at have done that and it is just a case of different approaches from different managers. “I know Colin [Cooper] really well and when he asked me to come in the summer there was no hesitation.